Rob Zombie's Zombie A Go-Go Records pours out classic surf-rock with class. 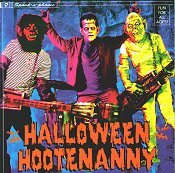 On their latest release, HALLOWEEN HOOTENANNY, they give the ghosts and the ghouls their dues, while also bringing forth some music to enjoy before, during, and after Halloween. Blending rock-a-billy acts with surf acts, here is one concept compilation that hits the mark. With well-known artists such as Rob Zombie, Reverend Horton Heat, Rocket From the Crypt, and The Amazing [Royal] Crowns playing next to Portland, Oregon's Satan's Pilgrims, the Swingin' Neckbreakers, and Los Straitjackets, the music overshadows the holiday and takes on a life of its own. I'll openly admit, I'm not the biggest fan of White Zombie. It's safe to say their whole scheme never rubbed off on it. So, when Rob Zombie's (featuring The Ghastly Ones) "Halloween (She Gets So Mean)" came on, I was blown away. Instead of the loud, hard rock that White Zombie was accustomed to, here we see Rob Zombie's rich, scratchy voice playing on top of surf music. Captivating, the song will drill into your head and haunt you until you sing along. Don't even try to resist, because you won't be able too. As the chills run down your spin, your lips will move along with the music in excitement. Such a great song, I'd personally like to hear Rob crank out a few more of these. Portland, Oregon's Satan's Pilgrims make a nice addition to this compilation with their splendid surf rock. "Gravewalk" is a slower number compared to the other tracks on this disc, but that doesn't mean it can't whip you into a frenzy like the others. As the guitar is spilling out the chilling surf notes, the rhythm section tingles with some solid beats. For the most part, the song is very monotone, but that doesn't mean they won't get you if you don't watch out! Always a treat, The Amazing [Royal] Crowns' punk-a-billy never fails with its goal to cook up some ferocious beats for you to dance, swing, and move along with. Jason's crazed lead vocals shock you hard with a good fright, while the rest of the band shakes and punches around with some fierce rock-a-billy moves. Highly interactive, as you feed off the song, the band seems to feed of your energy (even though it is a recording). How can this be possible, you ask? Well, don't ask questions. Just enjoy the music, have fun, and get sweaty. When you're riding with ARC, you're in for a thrill of your life. No Halloween compilation would be complete without somebody covering "'The Munsters' Theme." Taking on that duty is Los Straitjackets. In your face surf, as I sat there and listened to the song I couldn't help but want to rent some old Munsters shows and watch them until dawn. Of course, I didn't do it because I'm lazy, but I'm sure I'll get around to it sooner or later. In the mean time, this song will have to do (and it does a good job of quenching my thirst for the TV show...). Deadbolt's "Psychic Voodoo Doll" blends the essence of Halloween with a rock-a-billy/surf groove that never fades. Mysterious and haunting, the song draws upon your curiosity while sucking you into its world. The slow, eerie flow of the song invites you to sing along. Of course, you do, because it's just so much fun. Starting the same way the CD begins, Zacherle ends with a poem entitled "Happy Halloween." Yes sir, with this at the core of your Halloween, you surely will have a blast. But, I do realize Halloween has passed. Some of you may be missing it, eagerly anticipating next year's haunt-fest, but why wait? Get this CD and re-live Halloween every day until the real one comes along. I'll give this disc a B+.